‘Tis the season for hot chocolate, fireside cuddles with a good book, and . . . filling out tax forms. Only accountants rejoice at that thought, and even they face the season with a mixture of anticipation (Payday!) and dread (long hours). 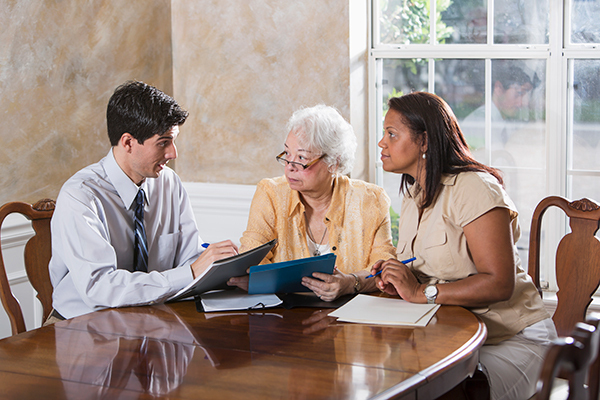 When you bring an elder into your home, often the last thing you are thinking about is the tax implications. If you are not yet providing in-home care for your parent or other loved one, this is a good time to begin giving thought to how you will handle financial arrangements including filing taxes. What receipts do I need to keep? Should I file a separate form for Mom or list her as a family member? Can I claim her as a dependent? Does she have to live with us in order to be claimed as our dependent if we are supporting her? What if several family members are contributing financially to her support? How should I handle her medical expenses? Which costs are deductible? Can I deduct incontinence supplies? Is there a deduction or tax credit available if I hire a caregiver for Mom while I am at work? Most of these questions are beyond the scope of this article, of course.1 Be sure to consult a qualified tax advisor, especially the first year you are dealing with your elder’s taxes. This advisor should be experienced in dealing with eldercare tax law, both with the IRS and with the tax laws of your state. This year’s investment could pay off in tax savings and you may even find that you can file the forms yourself in ensuing years once you understand what the law requires. Even if you hire someone to handle this year’s taxes there are still several steps you can take to make next year’s tax filing easier and potentially less costly. For example, friends who are CPAs tell me that, all too often, people bring them a shoebox full of receipts at tax time. The clients end up paying the CPA’s steep hourly wages to do the sorting they could easily have done themselves. Consider dividing responsibilities among siblings. My brother-in-law handles all of the finances, including taxes, for my mother-in-law while we handle the day-to-day caregiving, substantially lightening our load. Ask your tax advisor whether it is more advantageous for your loved one to file separately from you or whether it makes more sense for her to be listed as a part of your household. Assign a place to keep all of your receipts together. This could be a file folder, a large manila envelope, or even a cubbyhole in your desk. When you open the mail, or pay a bill, the paperwork goes to that place every time. You don’t want to miss any deductions because the receipts were buried in a pile of papers someplace. Keep good records, whether in a notebook or on your computer. Ideally you will record the various expenses as they come in, or at least monthly. At a minimum, group receipts into batches with medical receipts together, housing receipts together, etc. If you claim your parent as a dependent you will need proof that you provided over one-half of her support. Don’t procrastinate—it will cost you. Don’t wait until the last minute to begin filling out tax forms. Some tax-saving actions must be completed by certain deadlines. Don’t be afraid to ask questions. Other caregivers are often willing to share tips for deductions you may not have considered. However, your tax consultant is the most trustworthy source of information. Whether you curl up in front of a good movie to sort receipts or ask a friend to sit with Mom while you do taxes in a quiet nook at the library, give yourself the time necessary to do the job right. Be thankful that you have enough income to warrant paying taxes. Take time to thank the Lord for those road workers, first responders, librarians, and others whose salaries are paid through our taxes. And be thankful for that loved one who cared for you and, yes, sat up late doing taxes when you were in their care. Paying taxes has now come full circle.